I'm working on a software with lots of iteractions to generate graphics. it would be nice to have a feature like, skip first 'n' frames or seconds before capturing. I'm generating high res graphics and software takes a while to "populate". Maybe as a CLI only feature. Why not just put the code into your QC comp. Let the comp run with only minimal rendering patches, enough to get your graph executing and "populating" the data to begin with. Then a a pre-determined time or a programatically determine point, switch on the hi-res rendering patches. 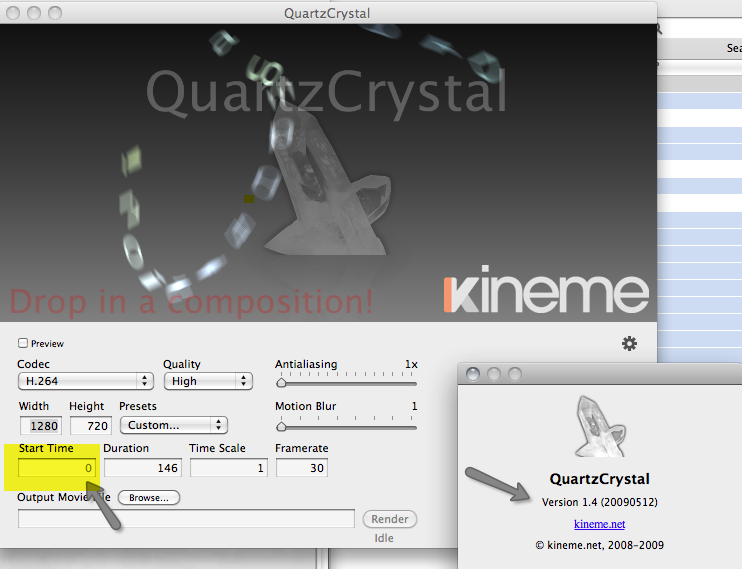 Then just trim the junk rendering output from Quartz Crystal's output file(s). This is useful I'll try that. In more recent versions of Crystal one can choose a start time. Certain things like queues and feedback my still need to start up. You just have to set it yourself.